Arthur Ashe is perhaps Richmond’s most successful athlete and continues to serve as a role model to this day. He’ll now be honored in perpetuity with the renaming of a main route through the city. Richmond City Council voted 8-1 (with Reva Trammell abstaining) Monday night in favor of an ordinance to rename Boulevard for Arthur Ashe. After a public comment period and Council discussion, the vote took place around 9:00 PM at City Hall. The effort began last August when Councilwoman Kim Gray and David Harris, nephew of Richmond tennis great Arthur Ashe, floated the idea at a Scott’s Addition Boulevard Association meeting. No word on when the actual street signage will change. The US Postal Service will honor the current name for up to five years and forward mail to new addresses during that time period. Richmond native Arthur Ashe broke racial barriers as a tennis player as the first black player selected to the United States Davis Cup team and the only black man ever to win the singles title at Wimbledon, the US Open, and the Australian Open. Playing in segregated Richmond in the 1950’s, Ashe wasn’t allowed to play against white children his age and wasn’t allowed on the local indoor courts or the courts in Byrd Park. Despite these challenges he triumphed and become a role model across the country. Arthur Ashe’s nephew, David Harris, spoke before the audience at the Scott’s Addition Boulevard Association this morning with a proposal to honor his uncle. 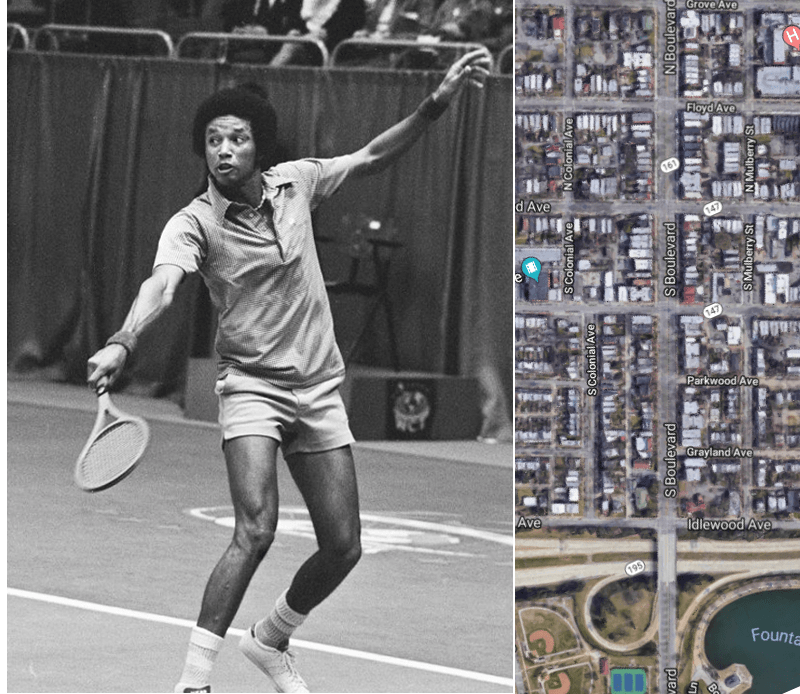 Harris would like to see the Boulevard changed to Arthur Ashe Boulevard. The timing of this proposal is not accidental. The Arthur Ashe center located on the Boulevard is likely slated for demolition, so it would be fitting to rename the Boulevard after the tennis legend. The Byrd Park tennis courts which previously banned all black players including Arthur Ashe also lie along the Boulevard. This isn’t the first time this name change has been lobbed up. About 20 years ago a similar measure was proposed but the effort was stymied by local businesses who felt that the expense of changing their letterheads–among other factors–was prohibitive to honoring the Wimbledon winning tennis player. Over the coming weeks, the proposal will go before the Museum District Association and Fan District Association to get their feedback on the measure, and a community meeting will be held at the Virginia Museum of Fine Arts at a yet-to-be-determined date. Barring any overwhelming outcry, Councilwoman Gray hopes to take the measure to City Council and through the formal process later this year.